The shirt came from Tanga. You might notice this shirt is 85, and that we skipped one. There is a shirt to be posted, but I could not bear to finish it last Friday. It will get posted, albeit late, and we hope you will forgive us. 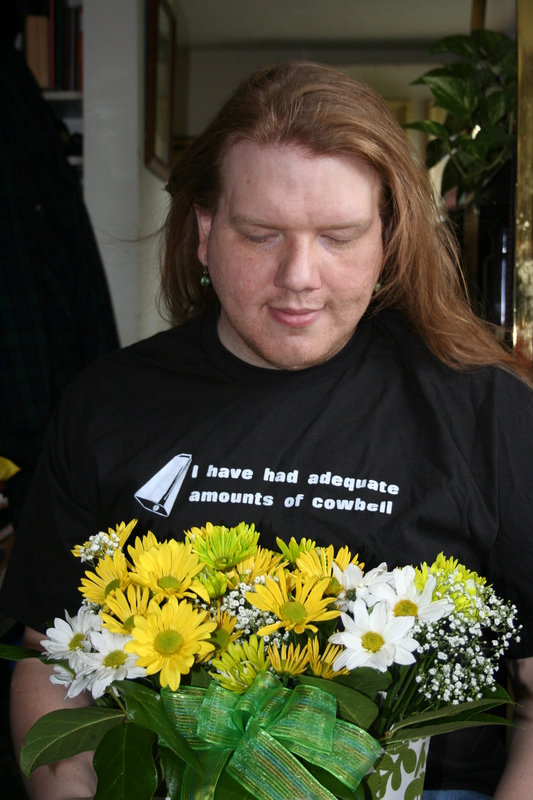 Skotte was seen wearing a different cowbell shirt here. Today’s shirt has a less feverish tone. Maybe it’s the sort of shirt you wear after a really good concert, when you are fully saturated with the ambiance of cowbell. Or after you’ve spent a drunken night sleeping it off in a cow pasture. We want to thank everyone who has commented, offered prayers, hugs, love, and a memory of Daisy. It means so much to us. The abrupt nature of what happened has knocked us to the ground and shaken us up. But connecting with you all has made this bearable. We want to call out some exquisite women who sent us the gorgeous bouquet of Daisies seen above. It leaves me speechless, which is something that happens often face to face, but rarely on the internet! Thank you to Michelle, Tiffany, Nay, Stephanie, and Karen for brightening our day, and remembering Daisy with us. The daisies are gorgeous, and were her namesake after all. Thank you all, so much. When we named Daisy, I got out an Anne Geddes baby name book we had for some reason, and we spent hours looking through it. We sat on our front porch step, side by side, late into the night, trying name after name. “Daisy” fit our new corgi so well. We knew we had no other choice but to let it go from our baby list. Daisy Quag Myers was born into our lives. This year has also been particularly hard for me, something which I haven’t talked about much. So maybe this will be cathartic tshirt week here at The Avalanche. We lost four very special family members within the past year. First Aunt Bette was killed in a bus accident in July (read here). Then, Great Uncle Cliff left this earthly world in December. Great Aunt Elsie passed away suddenly from an unknown illness in January. Lastly, Uncle Jim passed away after an epic battle uphill with lymphoma also in January. Uncle Jim fought this battle with every fiber of his being, every medical miracle available, with his ever-loving family slaying beasts and dragons by his side. It was devastating that his journey was not longer. All of their journeys. I haven’t been able to talk about this until now, so I thank you for reading. Do you have any cathartic tshirts? Do you have any sorrows you want to share with the class? We’re out here, we’re listening.